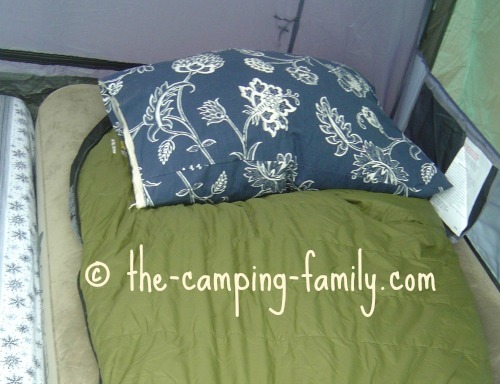 A full size air mattress might be the solution for you, if sleeping comfortably in your tent is your main concern. This is an especially good option for reluctant campers who would really prefer to be at home in their own beds! You can tuck yourself in at night and sleep in comfort, cushioned from bumps and lumps. You won't even know that you are sleeping on the ground! At home, a full size air mattress can be a guest bed! It doesn't take much storage space, and it's easy to set up. It's nice to have an extra bed when you need one. Before you can enjoy a good night's sleep on an air bed, you need to pump it up. 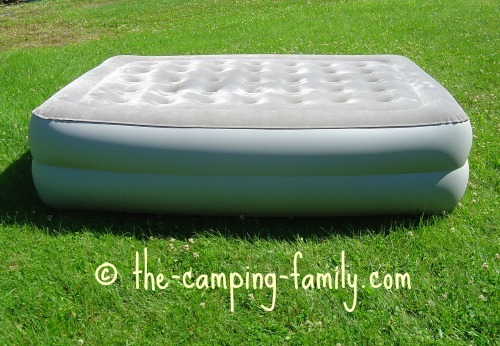 Some inflatable air beds like this Coleman air bed have a built in pump and motor. Just plug the pump into an outlet and turn on the switch. Other air beds require that you have a separate pump. ... or you can pump the mattress with a hand or foot pump. If you decide to pump by hand, I recommend using a double-action pump like this one. . This type of pump moves air both when you push down and when you pull up, so you are done in half the time. If you use an electric pump - whether built in or not - you'll need a power source. Some pumps, like this one , plug into your vehicle's power outlet or cigarette lighter. 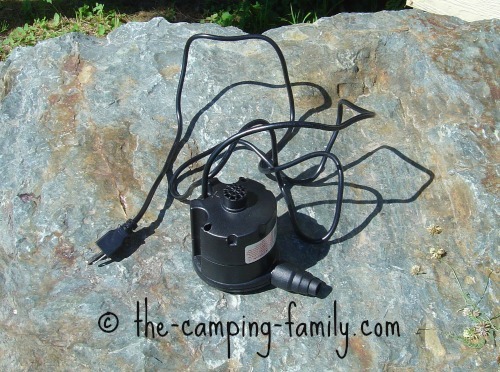 If your pump doesn't, you'll need a campsite with electricity. Another option is to get a cordless, battery operated model like this one. Whatever type of pump you choose, be sure that its nozzle fits your mattress' valve! Unless the temperature is very warm, you may get chilled. If the ground is cold, the air in the inflatable mattress will be cold too - and so will you! 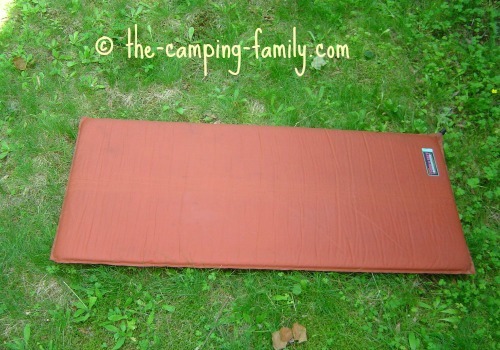 A thin sleeping pad like a Thermarest will actually insulate you much better than an air bed will! The bed might get a puncture. An inflatable air bed can be easily punctured. Slow leaks are very common. A leak may be hard to find and hard to fix. If you want to move a full size air mattress, you can't just pick it up and carry it easily. You will need a really big tent to accommodate a full size air mattress. Read about large cabin style tents here. 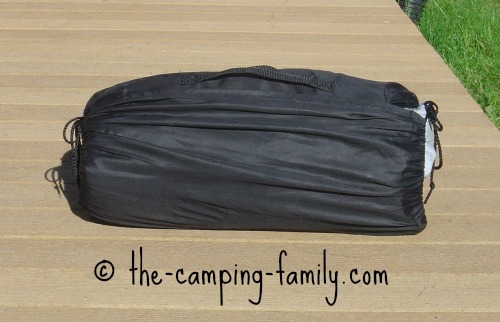 A portable air mattress packs up fairly small, but it's heavy. I'd rather not carry one very far! Fortunately, most of those difficulties can be overcome by using some common sense measures. Be sure that you know how to use your pump. Inflate the mattress at home. If you are planning to use sheets on the air bed, try them on the air bed at home. 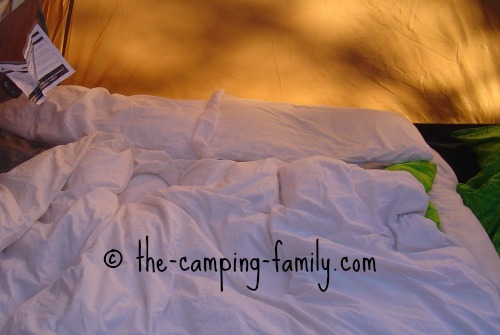 You don't want to get to camp and discover that the sheets don't fit! If you will be using an electric pump, make sure that you have an appropriate power source. Can you use your vehicle's power, or will you need a hook-up at the campground? If you are using a battery-operated pump, make sure that your batteries are fully charged. If there is chance that the nights will be chilly, put a thin foam pad under the air bed to insulate you from the cold ground. Protect your bed from punctures. Keep your mattress away from sharp sticks and stones. Never over-inflate it. An over-inflated mattress is more likely to puncture. Don't let anyone jump on the mattress. If your pump has a loud motor, plan to arrive at the campground and set up early in the day. 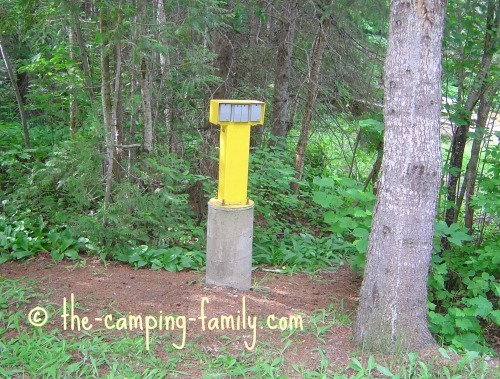 You won't endear yourself to your fellow campers by running a loud pump late at night! Never put an infant to sleep on an airbed that is soft or underinflated. For more information on safe sleeping arrangements for babies, click here. 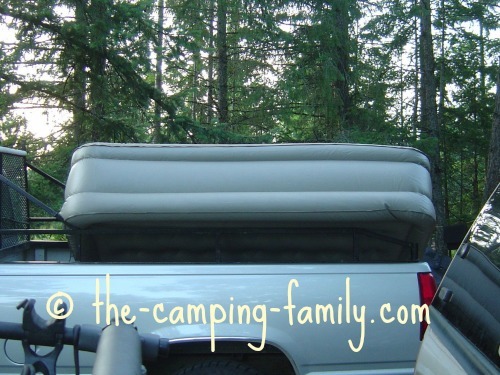 If you like tenting, but don't relish the idea of sleeping on the ground, a camping air mattress might be the solution for you - especially if you have lots of room in your vehicle, and a strong person to carry the bed and the pump! Now that you know whether a full size air mattress is right for you, click here to learn about the other sleeping pad options. Planning a camping trip? I have lots of tips and tricks that will help! Visit The Camping Family home page to get started.